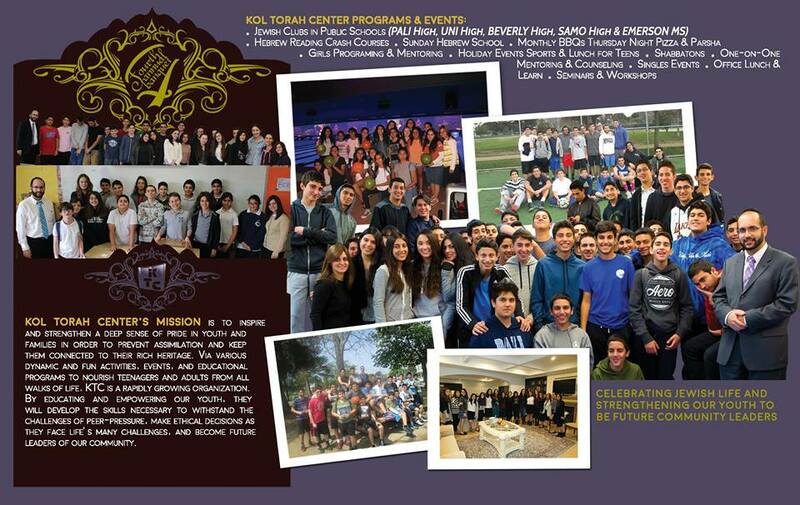 Kol Torah Center’s mission is to inspire and strengthen a deep sense of pride in youth and families in order to prevent assimilation and keep them connected to their rich heritage. Via various dynamic and fun activities, events, and educational programs to nourish teenagers and adults from all walks of life, KTC is a rapidly growing organization. By educating and empowering our youth, they will develop the skills necessary to withstand the challenges of peer-pressure, make ethical decisions as they face life’s many challenges, and become future leaders of our community. Rabbi Yosef Khakshoor, the founder and visionary force behind this organization, received his Rabbinical Ordination from Yeshivat Ner Israel of Baltimore. He is also a certified Mohel, Sofer (scribe), and Shohet. Over the past 15 years, Rabbi Khakshoor and his wife have inspired many individuals and families through their Jewish outreach programs. Upon graduation from high school, Mrs. Devorah Khakshoor attended Maalot Baltimore Seminary. She then pursued a BA in psychology at UCLA. While studying as an undergraduate in UCLA, she actualized her passion of spreading Judaism by teaching Jewish philosophy and various topics to college girls. Aside from being a mother, she has been involved in programming, mentoring, and teaching teenage girls and young ladies. The Kol Torah Center staff is committed to utilizing their strengths, knowledge, and warmth to serve the community.